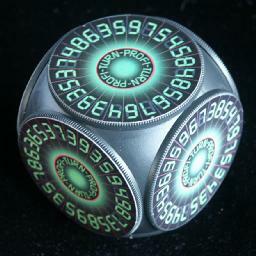 The Turn 12 puzzle is a cube with a numbered dial on each face. The six dials have 24 numbers on them in the range 3 to 9. The aim is to set the dials so that at all twelve cube edges where two dials meet the two numbers sum to 12. There are also simpler versions available with symbols or drawings on the sides, and then the aim is to get matching symbols at each cube edge. Turn 12 has a patent assigned to REFO Verlag GmbH, dated 28 March 2002, DE 20,112,728 U. Each dial has 24 possible positions, so there are 246=191,102,976 puzzle positions. There is a unique solution. German game archive alsoshows the other simpler versions of the puzzle. I cannot deep-link directly to the page so click Verlage, QbisZ, Refo image, and then the Turn12 image. I have not been able to find any pattern in the numbers on the dials (apart from the fact that adjacent numbers always differ). I have also not found any clever trick for solving the puzzle. Exhaustively searching for all possible solutions is quite feasible by hand - there are 24 positions of the top dial, then no more than 5 possibilities for matching the front dial, and these are quickly found to be a solution or not by matching the left or right dials. front 6, back 7, left 9, right 4.
top 6, bottom 6, left 3, right 4.
top 8, bottom 5, front 8, back 6.
front 6, back 3, left 4, right 7.
top 5, bottom 9, left 7, right 6.
top 3, bottom 8, front 9, back 5.